Al Smith (D-NY) was a New York politian from the early 20th Century who was the four time Governor of the Empire State as well as the first Roman Catholic nominee for President of the United States in 1928 . The Al Smith Memorial Foundation Dinner is an annual charity white tie fundraiser which dates back to 1945 and has raised millions of dollars for healthcare causes in New York., including $3 million in 2013. The Al Smith Dinner is always held on the third Thursday in October. As Stephen Colbert quipped about its calendary cycle, it is like Catholic thanksgiving. In 1960, Theodore White remarked that the Al Smith dinner was "a ritual of American politics. as candidates from both parties would share the dais and show a humorous or even self-effacing side. For example, last year both President Obama and former Governor Mitt Romney (R-MA) both attended the fete hosted by New York Archbishop Timothy Cardinal Dolan. The keynote speaker for the 2013 Al Smith Dinner was the Comedy Central host Stephen Colbert. While Colbert took some shots at New York City Mayor Michael Bloomberg and failed Democrat mayoral candidate and NYC Council President Christine Quinn and even Pope Francis, much of Colberts quips seemed reserved for Cardinal Dolan. So much so, it seemed like a Cardinal Roast. Cardinal Dolan and Stephen Colbert may have a chummy chemistry that was shown at a faith forum last year at Fordham University entitled "The Cardinal and Colbert: On Humor, Joy and the Spiritual Life". 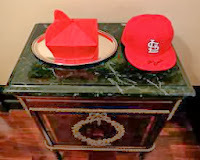 But one should not discount how both the comedian and the Cardinal share a passion for the Catholic faith as well as a jovial jocularity. 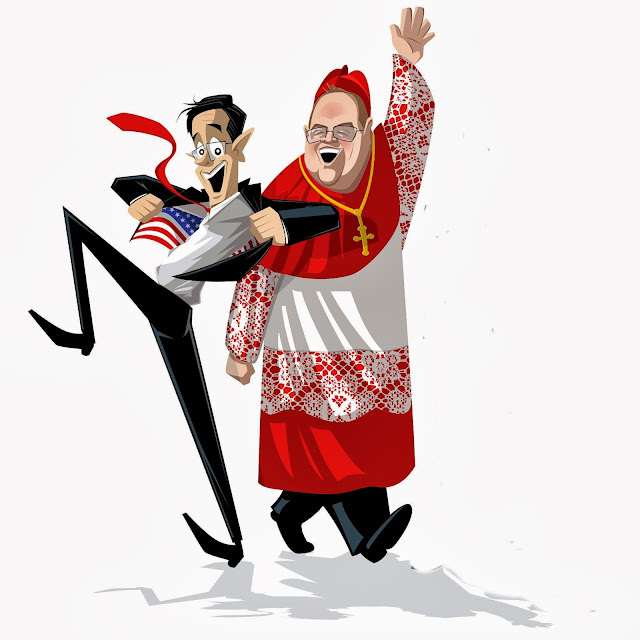 Some may frown upon Cardinal Dolan's ebullient embrace of "Laughter and the Lord". Others voice disapproval of the New York Archbishop sharing the stage with politicians at their conventions and then "yucking it up" at the Al Smith Dinner. I have to agree with designated chaplain of the Colbert Report, Fr. James Martin, S.J and his chiding of the "frozen chosen" approach to theology as being both antithetical to theology and eviscerating evangelization opportunities. 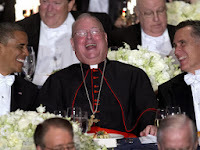 It is commendable that Cardinal Dolan was able to speak truth to power by offering pointed benedictions at the Republican and Democrat conventions yet inviting faithfulness and fellowship at the Al Smith Dinner. Cardinal Dolan echoes this convivial approach to faith. Dolan has observed: "Being Catholic is not a heavy burden, snuffing the joy out of life; rather our faith in Jesus and His Church gives meaning, purpose and joy to life. I love being a Catholic...". Besides, the Holy Spirit expresses itself in different ways, especially through pastors. Pope Francis has impressed many both inside and outside the Catholic community with his earnest aestheticism. But Dolan touches people with his joyful sensibility combined with his fervent faith. For Colbert's part, his humor was gentle and charitable. I will forever think of the title "Your Eminence" with a subtle smile yet appreciating the implication of the honorific. While Timothy Cardinal Dolan remains in New York after the Sweet Sistine 2013 Conclave Championship, at least Dolan's beloved baseball St. Louis Cardinals have reached with World Series this year without the existential threat of competing against the New York Yankees.